You need to write a paper. You have looked throughout the Internet and found Essayvikings.com, a funny-looking website that offers to help you with it. But we suggest you to read our independent review first and only then to decide if you are still ready to risk your nerves, money and reputation by ordering with them. Essayvikings.com is not a writing service in the usual sense of this worn combination, but rather a place where customers and writers meet. The process begins in the following way: you fill in the online order form, indicating all necessary details, such as the paper’s type, your academic level, number of pages, deadline and some specific instructions, submit it and wait until the writers interested in doing your assignment begin to contact you and offer their services. At first sight it seems like this system offers a unique possibility to fully control the entire process from the very beginning and choose the most expert writer. However, in practice you have to wait for rather a long time until somebody contacts you, especially if the topic is difficult or the academic level is high. In addition, the number of interested writers is not actually that big: in general, you have only 2-3 writers willing to proceed with your order. 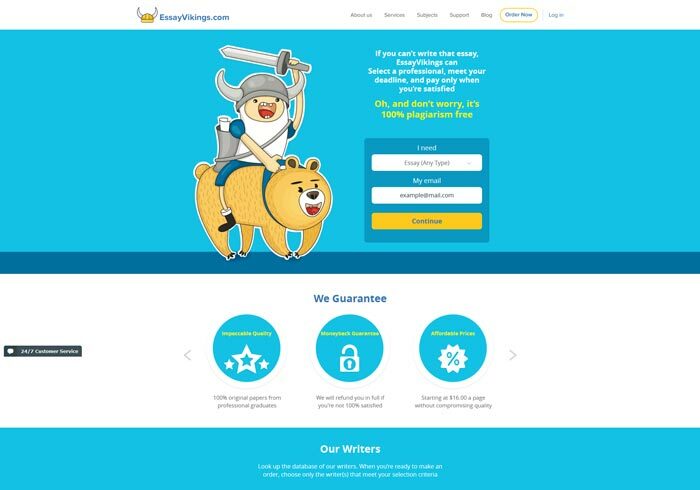 At Essayvikings.com the collaboration between customers and writers depend completely on their communication and agreements. Their performance is different from that of other companies, where you just place your order, pay for it and can forget about it until the day it must be delivered. You do not need to worry about the most appropriate writer or the price. You just pay and the professional managers will do the rest of the job. If, however, you have decided to use Essayvikings.com, be ready to spend a lot of time looking for a suitable writer, evaluating and analyzing different offers, negotiating, being nervous and exhausted. The writers are not always nice and polite, and when you reject their offers, very often they try to show you what a bad client you actually are. Keeping in mind the fact that the whole collaboration is built on the rating system of the customers and writers, bad comments can significantly decrease your chances to get a good writer. At Essayvikings.com there are no fixed prices. When the writer offers their services to the potential customers, they indicate the sum of money they are ready to do your assignment for. You can accept it right away or try to ask a discount, and if you are lucky enough, the writer will give it to you. Do not count on big discounts though. The writers are interested in keeping the clients, but they will not work for the minimal payment either. We need to say that the quality leaves much to be desired. Having contacted several writers, we have learned that not all of them are native English speakers. Two out of three papers that we ordered were had unsatisfactory quality. There were many grammatical mistakes, the sentences were structured badly and practically none of our requirements was taken in consideration. Add to this the communication issue with the writers and you will get the most horrible experience ever.